Dissapointing. The majority of recipes are not reminiscent of the dishes I found and loved in Britain's great pubs nor are they particularly enticing. When I think of "Comfort Food" beef cheeks are not the first thing that come to mind. Another let down from GR, I regret this Costco purchase and would not make the majority of recipes in this book. I really enjoyed this dish--maybe because I used my own home-made duck confit, which I thought was fabulous (I MISS Saintsbury's and their 4-packs of duck legs. Why can't we have that here?!?). I decided to make this meal after finding some "bangers" at the Sunflower Market (They aren't quite as good as the real McCoy, but better than nothing!). I really liked the unusual twist the mustard (I used Maille brand) gave to the mash. The red peppers were also nice because of the addition of thyme. I usually had bangers and mash with onion gravy in England, but I thought this was a lovely variation. It was also a relatively quick weeknight meal which took me 1 1/4 hours to prepare. Trifle has to be my favorite British pudding, and this is a good one. Instead of cubes of spongecake, this has slices of swissroll (which I made and filled with cherry jam) both on the base of the pudding and up the sides (it's nice to have that clear glass trifle bowl to show this off). My additions/changes: I had a 700g (instead of 350g) jar of Hungarian sour cherries with rum, so used all of it--and glad I did; instead of the sherry I used 2 Tbsp of the jarred cherry juice and added 1 Tbsp kirsch; also divided everything in half and assembled the trifle in 2 layers, then topped with all the whipped cream. Divine! In his outstanding new cookbook, Gordon Ramsay teams up with Mark Sargeant to showcase the best of British cooking. 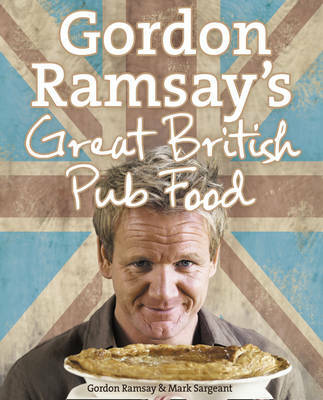 Packed full of sumptuous and hearty traditional recipes, Gordon Ramsay's Great British Pub Food is perfect for relaxed, homely and comforting cooking. Pubs were once a place where you could always guarantee good, simple, cheap food and a great Sunday roast, but when the steak houses and fast food chains arrived the good home cooking from the pub kitchens was replaced with tasteless, defrosted meals. Then came the gastropubs, which weren't much better, serving mediocre food at restaurant prices. That's why when Gordon Ramsay and Mark Sargeant set up the Gordon Ramsay pubs in London they wanted to produce the sort of simple but delicious British classics that warm the cockles of your heart and to serve them at affordable pub prices. Dishes like rich, hearty Chicken and Smoked Bacon Pie, mouth-watering Gloucestershire Sausages with Grainy Mustard Mash and Red Onion Marmalade and indulgent Treacle Tart - classics that have stood the test of time. Now Gordon has gathered his favourite British recipes into one sumptuous collection so you can invite your friends round, serve some good, English ale and cook the best in traditional pub food classics in your own home.